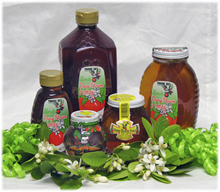 Orange Blossom Honey has a special sweet mild flavor that only comes from Orange Blossoms - Florida's State Flower. Of the many prized honeys, none is more unique than Orange Blossom Honey. When Mixon's Orange Grove blossoms in early spring, the air is filled with their perfume. Orange Blossom Honey is fragrant, delicate and perfect when spread on toast, waffles, pancakes and other breakfast breads.